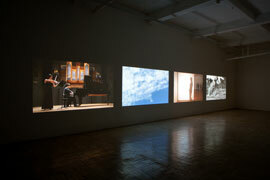 Michael Stevenson is pleased to present a four-screen video installation by Simon Gush. 4 for Four: A speculative montage for David Oistrakh and Sergei Prokofiev is a musical and visual composition with four storylines that are both independent and interrelated. The piece takes as its point of departure the relationship between the Russian virtuoso violinist David Oistrakh (1908-1974) and Sergei Prokofiev (1891-1953), one of the most important Russian composers of the 20th century. The two were friends and colleagues who suffered the tensions of working under the Soviet regime while striving to contribute towards shaping its new identity. The first video in the installation establishes this starting point with a performance of Prokofiev's First Violin Sonata in F minor. Prokofiev dedicated this piece to Oistrakh, who performed the first and third of its four movements at Prokofiev's funeral. Here, the piece is performed by violinist Nadja Nevolovitsch, accompanied by pianist Yannick Van De Velde. The sonata provides a soundtrack for the installation, and the tempos of each movement are subtly echoed as the pace shifts from screen to screen. The second screen depicts a panel of blue sky, interrupted only by clouds and the occasional bird. This is the sky above the Odessa steps, a reference to Russian filmmaker Sergei Eisenstein's silent film Battleship Potemkin (1925). This pioneering propaganda film dramatised the 1905 rebellion of the battleship's crew in the Ukrainian port of Odessa. The best-known scene is the (fictional) massacre in which Russian soldiers march down the steps, mercilessly cutting down the rebels and bystanders. This scene is regarded as exemplary of Eisenstein's theory of montage, where new ideas are seen to arise from 'the collision of independent shots'. In the third video Gush has multiple protagonists enact the illusion of walking through a wall. There is a reference here to David Copperfield's famous illusion of 1986 in which he walked through the Great Wall of China. Gush's primary interest is in the idea of the moment of being inside a wall, a concept that recurs in the artist's work as encapsulating a moment of potential. The final video focuses on the image of a Norwegian glacial landscape, static and silent. Alluding to the slow movement of geologic time, this screen is a reminder of the transitory nature of human life, a eulogy to the passing of Prokofiev and Oistrakh. Gush puts forward the notion of speculative montage as an open-ended response to Eisenstein's use of montage as a political tool. Fascinated with the complexities of 'speaking politically', Gush adopts a strategy of not approaching things directly, believing that the most effective way to communicate is through allusion and devices such as metonymy and metaphor. In his work, the act of 'saying something political' is continually examined and rehearsed. Gush held his first major solo exhibition, Sidestep, at Michael Stevenson in 2009, and his first European solo show, First and Third, at Galerie West, The Netherlands, in 2010. 4 for Four premiered in June this year at the SMAK Municipal Museum of Contemporary Art in Ghent, Belgium. Born in 1981, Gush graduated with a BA(FA) from the University of Witwatersrand in 2003, and in 2008 completed his postgraduate studies at the Hoger Instituut van Schone Kunsten in Ghent, Belgium. 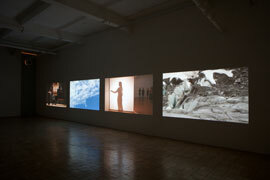 Recent group exhibitions include Halakasha at the Standard Bank Gallery, Johannesburg (2010); the Lulea Summer Biennial, Sweden (2009); and Die Keuze van Koen van den Broek at Indian Caps, Antwerp (2009). Gush will exhibit concurrently with Jo Ractliffe and, as part of the FOREX series, Eija-Liisa Ahtila. The exhibition opens on Thursday 21 October, 6-8pm. The gallery is open Monday to Friday 9am to 5pm and on Saturday from 10 am to 1pm.